Last week we talked about the 50th anniversary of the National Trails System. 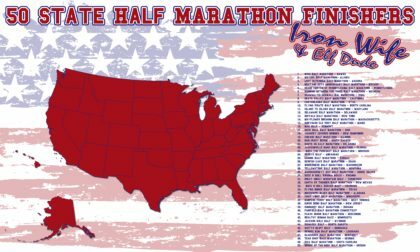 This week we celebrated a “50” of our own – we completed running a half marathon in all fifty states. Looking back on the 50, two of our favorite runs were in national park units – the Monument Half at Scotts Bluff National Monument in Nebraska and the EnviroSports Half Marathon in Death Valley National Park. 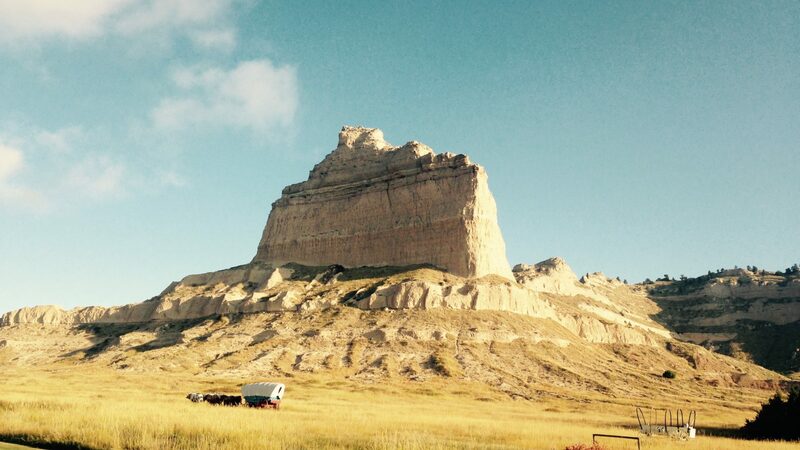 Why Scott’s Bluff National Monument? 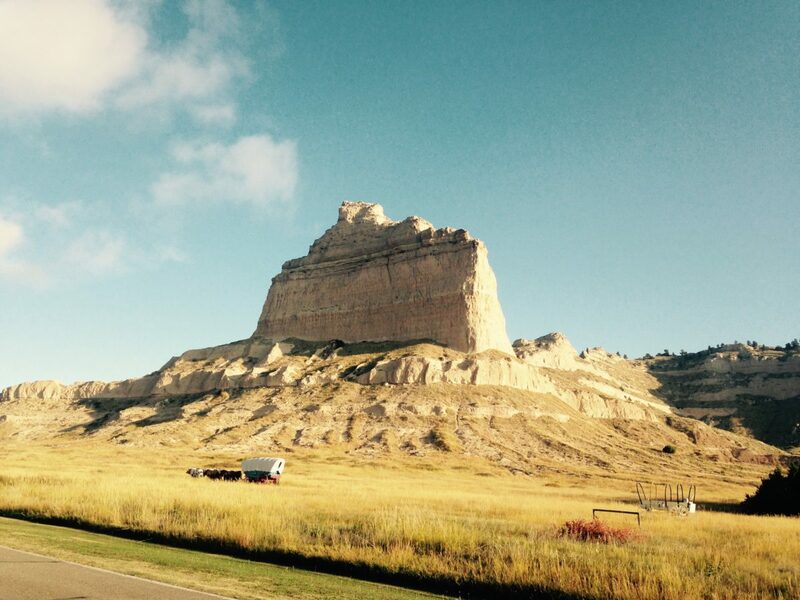 It is tough to pick a favorite race, but Scott’s Bluff stands out for so many reasons. 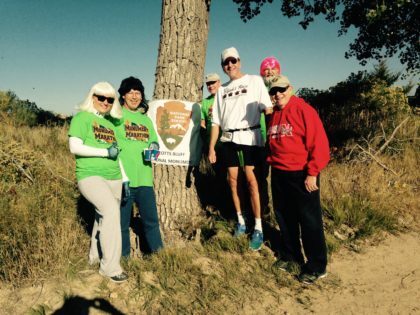 We loved the fact that the National Park Service put their full support behind the event. They were out at packet pickup with a relief map and information about the park, and coordinated with the event to bus event participants to the top of the monument (we went at sunset – it was gorgeous). The run/walk route went right through the park – first along part of the Oregon Trail and then behind the bluff on a service road that the National Park Service opened up just for the event. They were even out there manning a water stop wearing silly wigs to give folks water and cheer them on! It was great to see how the local National Park Service team supported their community. What a fun, enthusiastic group! It was also a great community fund-raiser for the local school and an event we were proud to support. Why Death Valley National Park? Have you ever wanted to run on the moon? 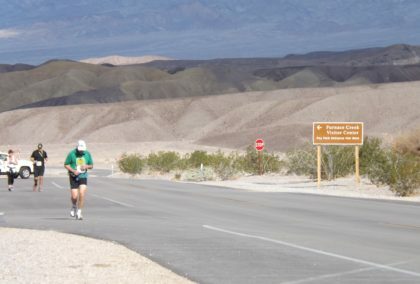 That’s what it feels like running in Death Valley National Park. It is so quiet… you don’t even hear an insect. But in this harsh environment, the support you receive from an organized event is welcome. They have to bus in volunteers from miles away to be there to hand out water and boy, is that ever welcome. There aren’t many running events that actually go into a national park unit. We have done a few. One ran through Harpers Ferry National Historical Park and another ran through Kitty Hawk – Wright Brothers National Memorial. Others take you near the parks. For example, Vacation Races puts on a bunch of “national park” runs. 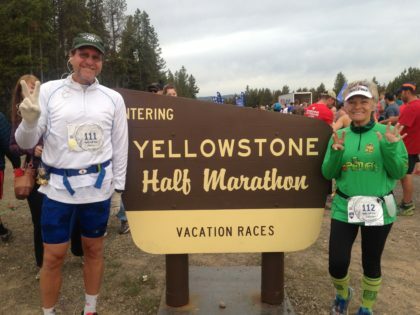 We did a couple – one that ran in the national forest just outside Yellowstone National Park and another that ran just outside Smoky Mountains National Park. Certainly if you like to get out and see the country and you like to participate in organized events like run/walks, with a little research you will find many events that you can tag on to a visit to a national park unit. We did this when selecting events in each state. It was fun and a great way to see and experience the country. We are excited to be done! It’s not a small feat… many folks haven’t even visited all 50 states. It was quite the journey. As we traveled to races, we made sure to visit as many of the near by national park units as we could. We didn’t just fly in, do the run and fly home. Instead we took the time to visit the surrounding area and especially to visit any nearby national park units. 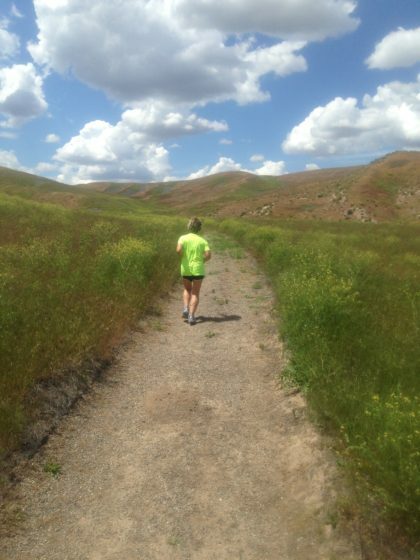 A special run we did was when we visited Hagerman Fossil Beds National Monument – there was a wonderful running path along the route of the Oregon Trail. One of our best get aways was a run in Fayetteville, Arkansas and a mini-vacation to the Buffalo National River. We also did a run in Jackson Hole Wyoming, home of the Grand Teton National Park and one in Moab Utah, home of Arches National Park. Another run was Bridge to Bridge from Assateague state park to Ocean City Maryland. That one got us to Assateague Island National Seashore, home to the wild horses. That place was amazing! Over the years, not only did we run in the national park units, we trained in them. 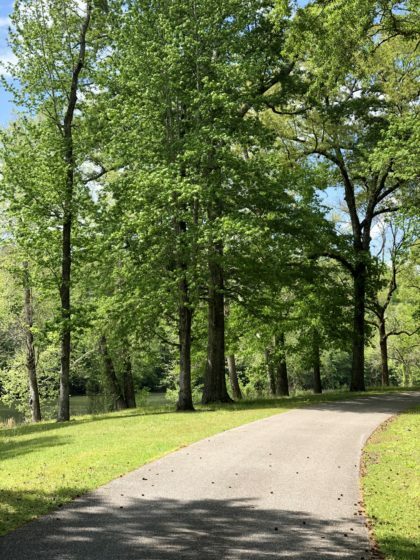 Many are great for training… one of our favorite bike/run training courses was up Bloody Hill in Wilson’s Creek National Battlefield and in Horseshoe Bend National Military Park. In fact, battlefields are usually great places to run, walk and bike, offering safe one-way loop roads. We also enjoyed training runs in Saguaro National Park, Lake Mead National Recreation Area, Delaware Water Gap National Recreation Area, Fort Scott National Historic Site (there’s a great bike path along the river) and at Lake Meredith National Recreation Area. We even ran in Washington DC – it was a half marathon to visit all memorials on the mall. It’s a great way to see a park unit up close… get out of the car! No matter what your goal – whether it is to run a half marathon, walk a 5k, or visit a brewery or winery or museum in all 50 states – get out and do it, and be sure to visit your national park units along the way. Nicely summarized. Fun reading how much your tour of 50 states for running overlapped with your tour of all the national parks. Thanks for sharing in your blog.